By Sia in Mobile. November 28, 2016 . Those who’ve ever tried to view a video on WhatsApp knows that it is a pain as the app requires you to download the entire video before being able to view it normally. Thankfully, this may no longer be the case as the WhatsApp Beta app has received an update that allows you to stream videos instead of downloading them first. 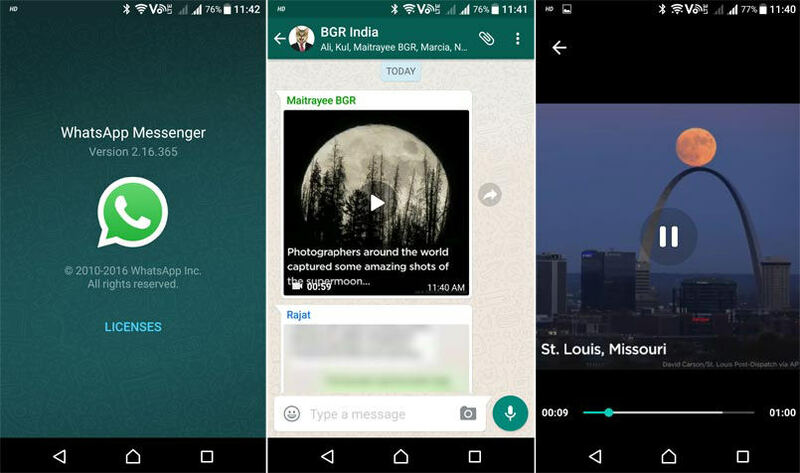 Currently available only on the Android version of WhatsApp Beta, videos that are linked in a chatroom no longer need to be downloaded in its entirety before you can view it. Now, all videos will be streamed to the phone, allowing you to view the video as it is being downloaded in the background. Of course, the ability to stream videos in WhatsApp is completely reliant on your data provider’s or Wi-Fi hotspot’s internet speed. If the connection is poor, be prepared to buffer your way through the entire video. No timeline was given as to when the feature will be available on WhatsApp proper, but you can expect it to be available on all versions of WhatsApp when the feature goes live.